We are going to begin to learn 10 problem solving strategies to put into your Problem Solving Toolbox. Not everyone will need the same equipment. It really depends on you and the way you think. And on the problem you are trying to solve. 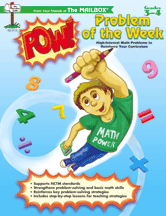 ACT IT OUT – This involves using manipulatives, or people, or drawings to help your thinking. FIND A PATTERN – paper, pencil, eyes, focus, and brain work is needed for this!